Planning a trip to Yellowstone National Park this winter? Yellowstone in winter is one of the most magical places in the world. The vast majority of park visitors come in the summer, but Yellowstone in the winter is out of this world. If you've never been to Yellowstone in the winter, you need to book your trip right now. Entering the park when it's blanketed in snow is an unreal experience. Whether you want to see geysers shooting into the crisp winter air, a herd of frost covered bison wandering down the road, or a pack of wolves roaming across the frigid and isolated Lamar Valley, Yellowstone is the place to be. The road from the North Entrance at Gardiner to the the North East Entrance at Cooke City stays open and plowed all winter long. Highway 191 stays open in the northwest corner of the Park. The West Entrance at West Yellowstone allows over-snow vehicles like snowmobiles and snow coaches to enter the park and travel on the main roads. What does this mean for you? You're going to need to carefully consider where you look for Yellowstone Winter lodging. And we have the perfect recommendation: Big Sky, Montana. 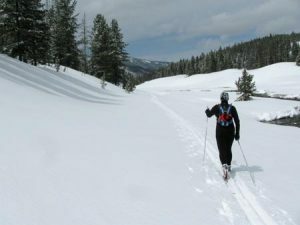 Most travelers who visit YNP in the winter fly into Bozeman, Montana (BZN). Big Sky is located about halfway between Bozeman and West Yellowstone. Situated just miles from the northwest corner of the park, it's an ideal place to set up your base camp for adventure. 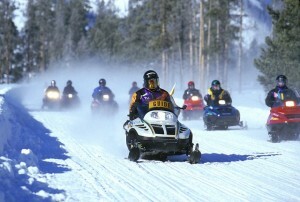 Big Sky offers easy access to Yellowstone National Park in winter. Plus, Big Sky is a mountain town that your whole family will enjoy. Not only does Big Sky have world class downhill and cross country skiing, but it also has dog sledding, sleigh ride dinners, arts & culture, snowshoeing, fine dining, and last but not least - plenty of places to stay. If you're looking for Yellowstone winter lodging, Big Sky is the logical place to start your lodging search. There are budget friendly hotels, high end resort lodging, guest ranches, and plenty of VRBO options to choose from. Add in all of the local amenities and you'll have your very own home away from home (that's also very close to Yellowstone National Park). Everyone needs to put Yellowstone National Park in winter on their bucket list. It's an experience of a lifetime. When you book your trip to this corner of the Greater Yellowstone Ecosystem, please put Big Sky at the top of your list for your Yellowstone Winter lodging. You'll love it here.